There's just one rule. Every post in this thread must contain at least one piece of pixel art, b&w or grayscale, any dimensions (within reason). Note the consistent thin blue line indicating a SourceCoder rendering. Those are both things I made for my forum when I had PSP5 (better than GIMP and Adobe PS in some ways). ...PSP5 (better than GIMP and Adobe PS in some ways). Hey now, pay attention to the rule! These are from my BASIC program Graph3D and an ASM beta of Document DE, respectively. It was basic enough that you could do alot with it. I do agree with you though, but in GIMP I cant seem to find much basic stuff that you need every once in a while. Its all barried down in the program. Pixel art in every post!!!!!!!!!!!!!!!!!!!!!!!! ok ok, lol sry Kerm for ruining your fun little thread. Heres a pixle art just for YOU! This is what I used to. 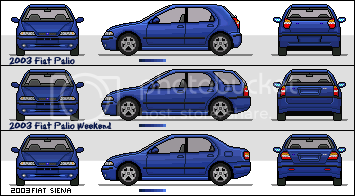 Manga Cars/Pixel Art Cars. These arnt mine but I can get mine on a disk and show 'em to you. Using the point to point, in psp5(by the way I would love to kno wthat gimp has manual point to point), selecting I could take out and put on body kits, areo kits and spoilers stuff like that to my cars. I would usually take a body kit and make a new body kit based off the old one. Now here is a GOOD quality Manga Car! OMFG this is one of the best you can do. This is the best I've seen. Nissan Skyline R35(a.k.a. Infinity G35). B E A Utiful! Check it out. And this is mine, the most ricerific car that has ever been introduced to this world. All thanks to me. lol. ITS FREAKIN UGLY! Edit by Catherine: Changed img to url, because members were getting malware warnings. Wow, that's pretty friggin' awesome. Experimenting with colored pictures I drew a colored map using GIMP2 and sent it to the Calculator still in the form I saved it in, it impresively redid the image to look very good quality on the calculator but as I progressed to send more and more the newest sent ones turned into black images with touches of white in the bottom right corner. then once I tried to open the older ones they were all like that. Is there a problem with the processor? can it not handle the pictures or something? ...no, you have to ClrDraw in between recalling pics. Oh haha! Ooops! oh golly! Jez!......ok sry that was just kinda a gay moment. What I am trying to say is, I already did that but even afterm it like corrupted my pics after too many uplaods or something. etc? 'Cause your error sounds exactly like what happens when you don't clear the graphscreen between recalls. Yah, I am not stupid enough to start through up pictures. it was not like it slowly started to black out like things were being over lapped. infact I cleared the draw many manys after it stopped working. Trust me, I probably clear the graph more than anyone. Hmmm, then maybe you had a messed up graph buffer? Try it again and see if it works. If not, do a ram clear and try again. Oh, so you're the one who did the intro screen for Dan? I must say, those are all extremely impressive. Nice work. There are 144 users online: 4 members and 140 guests. © Copyright 2000-2019 Cemetech & Christopher Mitchell :: Page Execution Time: 0.284192 seconds.